In another era Andy Murray would have been recognised as a ‘tennis great’ but such is the dominance of Novak Djokovic and Roger Federer – probably the two greatest players in tennis history – that even winning Wimbledon twice does not guarantee you a place amongst the pantheon of racket legends. Throw in Rafael Nadal and it is clear that Murray has been dealt a tough hand. This weekend, the Scot was playing in his 11th Grand Slam final and unarguably for the first time he was the clear favourite, having faced either Djokovic or Federer in the previous 10 finals. Ah! If only things fell into place in my life as easily and effortlessly as they did for Andy Murray in the past fortnight. Anyway, the draw was already positive for him, placing him in the other half to the likes of Roger Federer, while chief adversary Novak Djokovic has already been the victim of a shock exit. 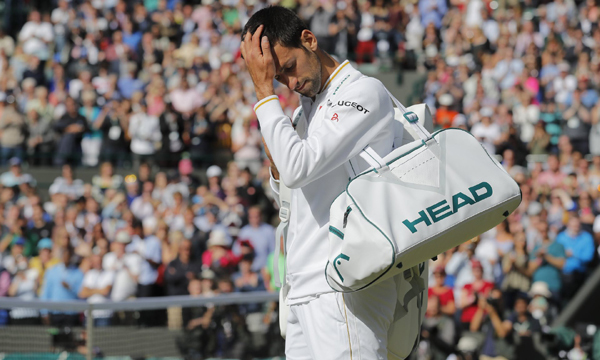 Has any athlete ever been lonelier than Novak Djokovic right now? Novak Djokovic after his defeat to Sam Querrey. Minus his five-setter against Frenchman Jo-Wilfried Tsonga, the British number one didn’t have to break a sweat, winning all his matches in straight sets, to reach his third Wimbledon final. Briton’s opponent in the semis was the Czech 10th seed, Tomas Berdych, who was a surprise obstruction on his way to the final; after Stan Wawrinka and Richard Gasquet both fell early. The world number two was barely troubled by Berdych who forced just one break of serve in the contest. With Serb Djokovic already out, Murray wouldn’t have believed his luck when he found himself against Canadian world number seven Milos Raonic instead of his former Swiss nemesis. Raonic beat Federer in a thrilling five set encounter to book a date with the 29-year-old from Scotland. Milos Raonic roars with delight on his way to a surprise Wimbledon semi-final victory over Roger Federer. The Swiss great feels pressure during a fifth set in which Raonic took control just when it mattered most. Raonic proved just why he is one of the most promising young players on tour to reach a first ever major final. Federer feels that sinking feeling after taking a tumble during the deciding set with Canadian star Raonic. Andy Murray made full use of his first Wimbledon final after his 2013 win by dispatching the Canadian 6-4 7-6 7-6 in three sets. 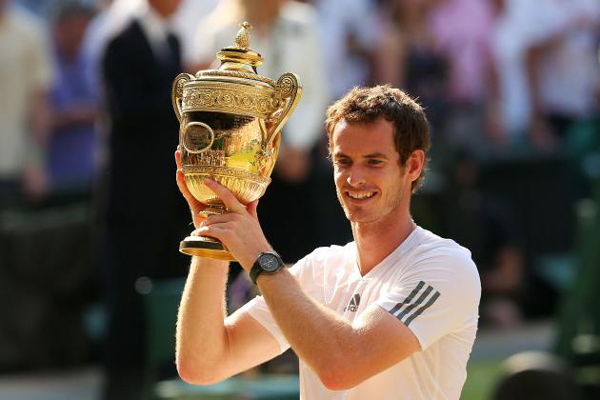 Murray gave a famously tearful speech after losing his first Wimbledon final against the Swiss maestro Federer in 2012. A year later, he finally ended Britain’s 77-year-wait for a male champion, a quest that became burdensome for the whole nation. 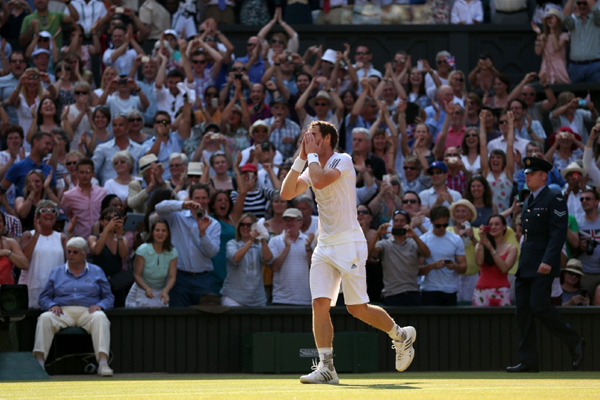 This Sunday Britain’s tennis heartthrob doubled that tally by claiming his third career Grand Slam. Britain’s 77-year wait for a men’s Wimbledon champion is over as Andy Murray celebrates victory over Serbia’s world number one Novak Djokovic. While his 2013 victory ended with him feeling intensely relieved, enduring “so much stress and pressure” to end his country’s agonising seven decade men’s title drought , this time around the scruffy Scot plans to thoroughly savour the success. Murray wasn’t also discounting how luck played its part in the triumph. 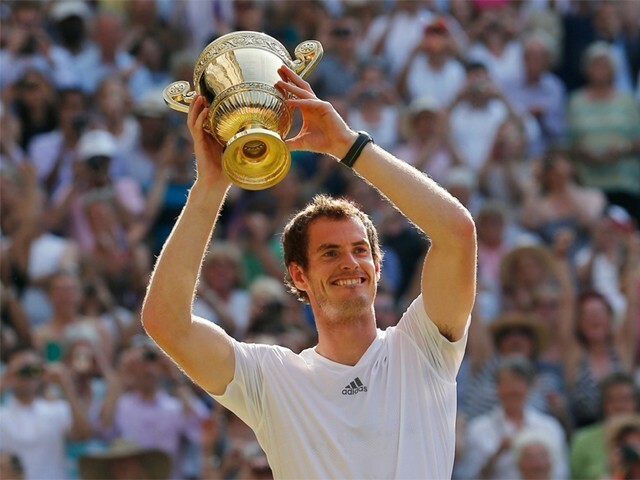 Andy Murray of Great Britain poses with the Gentlemen’s Singles Trophy following his victory in the Gentlemen’s Singles Final match against Novak Djokovic of Serbia on day thirteen of the Wimbledon Lawn Tennis Championships at the All England Lawn Tennis and Croquet Club on July 7, 2013 in London, England. There is plenty of evidence to support Murray’s belief that his best is yet to come and with both Federer and Nadal losing their touch with age, the Briton is now primed for the top slot, albeit with a Djokovic sized obstacle in the way. Is Andy Murray in place to be an all-time tennis great? Huh? Who the hell is Andy Murray?